I was kindly sent this Crazy Soap set to do a review. I couldn't wait too put my girls in the bath and use them as i knew they would love it! I'd never really hear or seen anything like these before and from having these too review i have already put the Crazy Soap Foam on the girls' Christmas List YAY!! You can get this in either white foam or green foam! How cool is that?! When i saw on the bottle you could shape it, i thought 'no way?' because it's foam yeah! So i think i was a little too excited too use this too ha ha! Well anyway.. you CAN shape it! It doesn't stick on to your hands either, Mia wanted to make ball shapes with it and then i'd clean her then! She had so much fun with this! The first thing we did because it was foam was we squirted the foam on mia and Elliws head, had to be done lol! Elliw didn't even notice we had done it lol! What i liked about the foam was it had a lovely fruity smell to it! 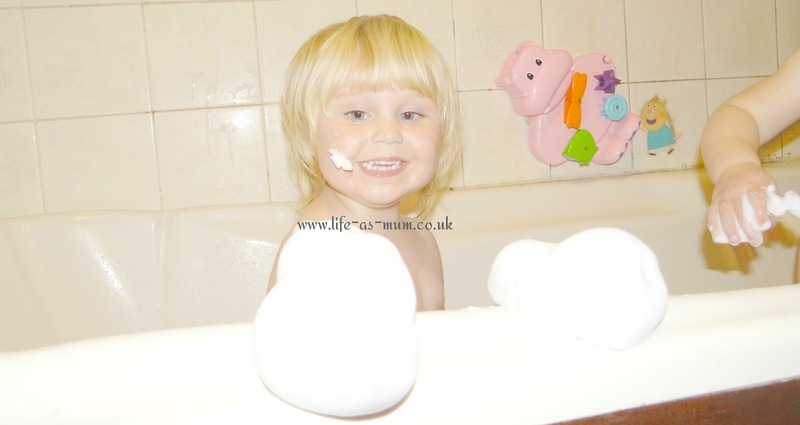 The Foam soap can be shaped and bounced! There is PH balanced formula to gently cleanse and moisturise delicate skin! Also it is SLES and Paraben free! Butane, Isobutane and Propan - these are natural colourless and odourless gases which can be used in the formulation of shaving cream, cleansing products, hair conditioners and make up! Palmitic Acid - This is a fatty acid which is found naturally in skin so this makes it very safe to put on your child's skin! Triethanolamine - This makes the Ph balance right and keeps everything in order. Parfum - This makes the lovely smell in Crazy Soap! Citronellol is just a natural scent derived from plants such as rose, geranium and lemongrass! CAUTION - Please read the label if you decide to get this product. Foam must not be squirted in the eyes, ears, nose or mouth! Do not allow contact on carperts, walls or any furniture! Can be stained. Mia didn't want this on her, i have no idea why, so we used it on Elliw! But only a little bit! I think Mia would have enjoyed it if she would of let me use it on her but she was very determained she did not want it. So i gave up! They say it is easy too come off the skin, i didn't find it that easy to come off really but eventually it did! But i do think if you want your kids too have fun in the bath this soap would be ideal for your kids! This is available in red and blue colours! When she came out of the bath, ahh she was so soft! Which i really love is a soft babies skin. Aqua - Well it's water! Glycerin - This is a moisturiser originating from a vegetable sourse. This helps to prevent dryness and make sensitive skin soft and smooth! Propylene Glycol - This works as a humectant which causes the skin to keep moisture by preventing water from escaping! Cocamidopropyl Betaine - This creates the BUBBLES!! Xanthan Gum - this is NOT gum - it can be found in many food products to thicken and stablise them. Glycol Disterate - this is a skin condition that makes the skin soft whilste increasing the controlling thickness of the product. Laureth-4 - This looks after Glycol Distearate when it is lonely as a stabilizer, Glycol Distearate always needs this Laureth 4 too work properly! Parfum - Well obviously too give it a lovely smell! DMDM Hydantoin - this is an organic microbial compound which Crazy Soap use as a preservative. Methylchloroisothazolinone - Ahhhh! This is a preservative with antibacterial and antifungal effects withing the group of isothiazolinones. Mehylisothiazolinone is a preservative. Which Crazy Soap use it to prevent bacteria and mould growing in their soaps! 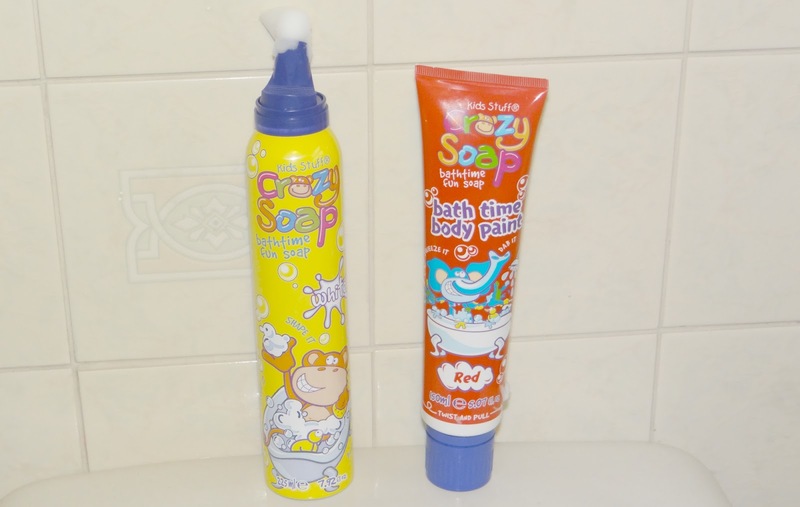 CI 42090 and CI 16035 are the colours Crazy soap use to make their Soap Body Paints! Lovely but and radiant red colour! CAUTION - Must always be used under adult supervision - do not use on damanged or broken skin, do not swaller. Do not make contact with face or floors, furniture etc! Overall - I would really recommend these Crazy Soap Foam and Paint! I am even buying them as a Christmas present and after! You can look at their website here and purchase them on Amazon. Have you seen the Giveaway i'm doing? Check it out here and win yourself a Crazy Soap Set!